The Grindley House is a one-and-a-half storey home located on the west side of Blackville. This vernacular residence has Greek Revival elements and is situated at the crest of a hill. The Grindley House is designated a Local Historic Place for its architecture, for its association with master builder William Murray and for its association with its former occupants. The Grindley House, built circa 1840 by Newcastle (now Miramichi) master builder William Murray for local mill owner Alexander MacLaggan, is one of the oldest buildings in this community and bears characteristics of architecture comparable to rural Scotland. 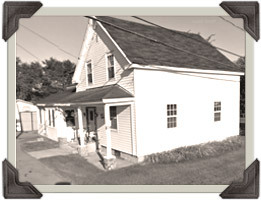 Murray’s buildings remain as the Miramichi area’s earliest wooden architecture still in existence, dating from the 1820’s to 1840’s. His medium of construction was white pine and so his buildings act as reminders of bygone days when the area’s forests were plentiful with the massive timber. In 1867, Grindley House was the residence of MacLaggan’s widowed daughter, Elizabeth Porter. Grindley House is also valued for its associations with its former residents, merchant, postmaster and second husband to Elizabeth, William Herbert Grindley and their son Robert. Robert Grindley was an enterprising man who attempted several significant business ventures within the community and impacted its development during his residence at Grindley House. He was a founding member of the Blackville Cheese and Butter Company in 1904. He started the Blackville Printery and published Blackville’s only newspaper, “The Advertiser”, a semi-monthly paper from 1905-1906. In 1907 he introduced the “Grindley Exchange” a telephone system that served Miramichi River residents from Upper Blackville to Renous. Grindley’s attempts at business appear to have resulted in early closure. He died at a relatively young age of 45 years in 1913. From 1867 to 1903, the Grindley family operated the village Post Office from here. Subsequently, the Barry family lived here and carried on the village postal service. This place is also valued for its association with later resident Dr. John Beaton, who lived here while he served as doctor to the village.